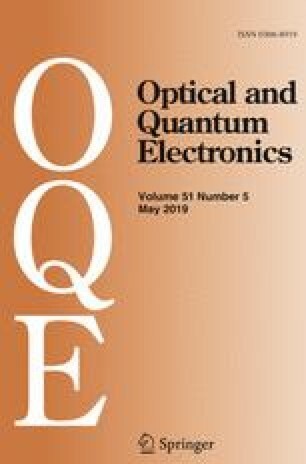 In this paper, a hybrid electro-optical modulator based on a one-dimensional photonic crystal nanobeam cavity is proposed. The main component of the cavity builder is the indium–tin–oxide that is a transparent conductive oxide. The proposed structure is used to minimize optical losses and also to have a high-quality factor with a tunability from the distributed feedback system. The proposed modulator has a wide range of resonant tunable in a footprint of 1.892 μm2. This structure has the ability to shift the wavelength of 1.55 μm using a very small voltage 0.1 V. Simulation results show that the proposed structure has an insertion loss of 0.027 dB, extension ratio 3.484 dB, 119.89 GHz modulation speed, and 0.59 aJ/bit modulation energy. By comparing the proposed method parameters and other modulators based on the one-dimensional photonic crystal nanobeam cavity, a significant improvement in modulation voltage, insertion losses, energy consumption, and footprint have been observed.